When you live in a town that celebrates 1,000 pound gourds each year, it tends to rub off on you. So, I created a pumpkin doll. This was last year's and I had planned on making a new "giant pumpkin" doll each year. As I make each doll, their personality develops. 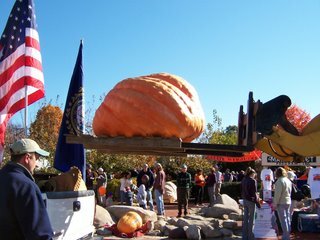 Here's the bio that he came with: "This amateur grower is ready to enter his giant pumpkin in this year's County Fair (at 77 grams he may have to enter in the light-weight division!) When he's not working in his garden, he's studying his other passion, phrenology - who has time to comb their hair?" His arms, legs, and hands are wired for posing and his hair is locally raised mohair. 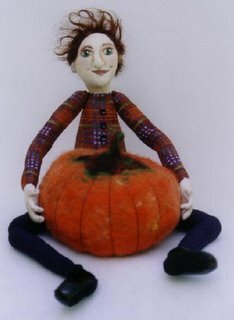 The pumpkin is felted wool. He's about 8" tall sitting. To make a long story short, he was sold this weekend and it feels really weird! I usually don't mind selling my dolls - I'm usually not very attached to them once they're completed - it's the proceess of making them that I really enjoy. But, this one was really unique. I don't know where the phrenology thing came from - maybe the lumpy pumpkin or looking at too many weird rubber stamp websites. Well, now I'll just have to start working on next year's giant pumpkin doll! 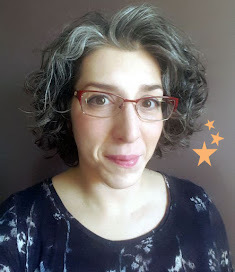 I have been working on new projects - tomorrow morning when it's light out I should get some good photos for posting here.